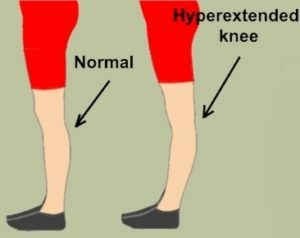 Hyperextension of the knee occurs when one’s knee extends too far backward and possibly damages the cartilage, ligaments and other structures that stabilize the knee. A strong sudden force to the knee is typically the cause of knee hyperextension and is commonly seen in athletes who play basketball, football and gymnastics as these sports require quick cuts, jumping and quick change in direction. Stroke, car accidents, falls and previously weakened hyperextended knees can also cause such injury to the knees. Treatments depend on the severity of the injury. P.R.I.C.E: Following the steps of P.R.I.C.E is the best start to treating a minor knee hyperextension. Protect your Injury from further damage, Rest your injury to gain strength and mobility, Ice the area to reduce swelling, Compress the knee area with athletic tape or bandage and Elevate your knee by raising it above heart level. Seek urgent medical help if the knee feels severely painful and deformed. Strengthening Program: A physiotherapist can safely guide you with exercises that will be effective for your injury in order to regain strength and improve the movement of your knee over time. Exercises will concentrate on strengthening the quads, hamstrings and calves. Knee Brace: Incorporate a knee brace with range of motion control for hyperextension. It can assist in adding the stability you need and prevents the knee from overextending in the wrong direction. A brace will support the ligaments by absorbing extra force and protecting the knee against excessive movement. The hinges on the brace controls ones range of motion and by limiting the degree of extension, can reduce the risk of re-injury. A compression brace is also good for recovery and it will promote blood flow and reduce inflammation, thus promoting healing. With the hinged knee brace, the degree of bend allowed can be adjusted as the healing progresses. Medication: Pain medication and anti-inflammatory medication can help with managing pain and swelling caused by the injury. Hyperextended knee surgery: Surgery may be required to repair damaged tissues in extreme cases. The procedure will be followed by a period of recuperation and physiotherapy, after which a gradual and controlled return to motion will be allowed. Maintain good knee posture: Be conscious of your knee postures during daily activities. Avoid locking out the knee while standing and practice good knee alignment while standing from a sitting position and stair climbing.